Watch this video of artist Dan Dos Santos creating the Warbreaker cover illustration. A fascinating demonstration. SYNOPSIS: Welcome to a land where gods and royalty, citizens and renegades, and everyone else coexist in tenuous harmony. Beyond wealth and social status, one aspect levels them all: Biochromatic magic, the essence of breath; the power to see color, feel color, and produce color. The power to give life. In a kingdom of exiled royals, an old treaty demands that the King of Idris send one of his daughters in marriage to the God King in Halladren. But instead of Vivenna—the oldest and more responsible princess groomed for this occasion since birth—her younger sister Siri is sent in her place to a fearsome gaudy city where color is wielded without consequence or care. For behind the opulent curtains of Halladren lies a complicated and explosive court of politics and tangled relationships between gods and priests, prophecy and followers. 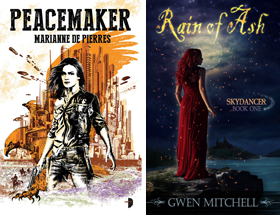 The fates of the major characters—the two princesses Vivenna and Siri; Lightsong, the reluctant god of bravery; and the wild card Vasher, the Warbreaker—will collide to determine the fate of the world, both the one on earth and the one beyond. He has been chosen to complete Robert Jordan’s A Memory of Light, the conclusion to the bestselling Wheel of Time® series. For fascinating behind-the-scenes information about the Mistborn trilogy and his acclaimed first novel, Elantris, visit him at www.brandonsanderson.com. I'm in love with the dress and hair on the cover. Both are gorgeous. I saw this book at the book store. The cover is beautiful. Warbreaker is on my wish-list. =) Thanks for the post! PopinFresh it is a very striking cover and I always delighted to see artists show us there craft. You're welcome Linda, I hope to get a review done eventually. I am reading this book now and am enjoying it. Do you know, I love the cover SO much, sometimes I stop reading, go back, have a look at the cover then resume reading. Plus, the cover is REALLY accurate and it depicts the main female character brilliantly. Ana I suspect the artist must have read the book if the cover is that accurate. Good to know. I haven't had a chance to start it yet but hope to on my summer break. Look forward to your comments on the book. 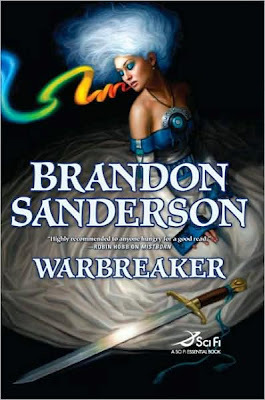 Simply put, Brandon Sanderson's "Warbreaker" is one of the best books I've read.